We're heading back to the picture house today and returning one last time to our early '80s science fiction theme. After Saturn 3 (1980) and The Thing (1982) we have Blade Runner, another film which is exactly three decades old this year. Queen to bishop six, check. Knight takes queen. Bishop to king seven, checkmate. That sequence must have set bells ringing for an awful lot of chessers. Is the position in Blade Runner exactly the same as the one reached in the famous Anderssen-Kieseritsky encounter? Since film makers love ornate chess sets to precisely the same degree that real players loathe them, it's hard to tell. It's obviously pretty close, though, and identical position or otherwise it's a great scene. 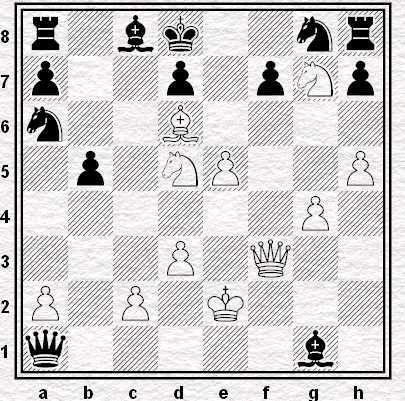 What we have here is a rare example of chess as exposition. The game is used as a plot device, not to foreshadow a theme that will emerge in the final act (as in Saturn 3), but rather as a way of moving the story forward. Roy Batty (Rutger Hauer) needs to end up on a roof giving his big "Attack ships on fire ... tears in rain" speech. To find his way there he's going to have to meet Tyrell (Joe Turkell) and the script brings the two of them together by having Batty intervene in a game of correspondence chess that the speccy capitalist is playing with a genetic designer and toy maker, J. F. Sebastian (William Sanderson). A marvellous little scene, and yet I wonder how it comes across to somebody who hasn't seen the whole film. I suspect that to fully appreciate the clip at the head of today's blog you really need to have watched every one of the 76 minutes that precede it. Batty is a NEXUS 6 Replicant. A 'skin job'. A robot designed to look exactly like a real human whilst being stronger, more agile and at least as intelligent as the engineers that created him. More human than human is the Tyrell Corporation motto. Immediately before Batty and Sebastian go to meet Tyrell we see them together with Pris (Daryl Hannah, also an android) in J.F's apartment. Replicants aren't allowed on Earth, but as a designer J.F. is not interested in the law. He just wants to see what these machines can do. Pretty soon Pris is fishing an egg out of a pan of boiling water with her bare hands and Roy is sitting at a chessboard. Sebastian explains that he is playing a game against Doctor Tyrell. "He's a genius", Sebastian says, explaining that he's only ever beaten him once. Batty takes a brief glance and pushes his queen forward. "No. Knight takes queen. See? No good", Sebastian tells him. Anachronisms, we have a few. There's the use of descriptive notation* and in the earlier scene we see Batty capturing the queen with a knight placed in the centre of the board and not from it's home square where it appears to be on Tyrell's set. We could also ask ourselves whether a chess genius is likely to be surprised by a mate in one and question whether a player like Sebastian would ever have reached the kind of position where Batty could launch his (Anderssen's) spectacular coup. Still, as drama for a mainstream audience it works. An out-of-the-blue queen sacrifice that turns a losing position into a winning one: that's what non-players think genius at chess is. What's more, it's a really rather subtle sequence. That Batty was right all along is never explicitly stated. You have to be one of us to see that he was**. A great scene then and without a doubt, my favourite of the little run of sci-fi films with chess scenes that came out thirty years ago. Have you been wondering why there were so many, all in a row, though? Well, the fact that popular culture of the early 1980s was chock-full of chess references can be put down to the fact that we were kings in the 1970s. That science fiction was a such a hot subject for movie-makers back then? That, I think, we can trace back to the film we'll be looking at next time. ** Blade Runner is a film notorious for its mistakes. Here, I think, we have an error, but one that rarely gets mentioned in the blooper lists. Replicants are supposed to be only "at least" as intelligent as their creators. In the chess scenes Batty displays a proficiency at chess over and above that of Tyrell who is supposedly a "genius". Ridley Scott fact: my wife was an extra in Kingdom of Heaven, albeit she was cut from the cinema version. You can however glimpse her as a serving-wench early doors if you watch it on DVD.